Cosmetic surgery is a deeply personal process that requires a high level of comfort and trust between patient and doctor. For this reason, we recommend that you never compromise when it comes to choosing your plastic surgeon. Otherwise, you could be placing your health at great risk. Before selecting your practitioner, it’s important to check for a few simple qualifications first and foremost. First is that your physician has been licensed by your state medical board. Secondly, make sure that he or she is certified by the American Board of Plastic Surgery; this indicates that they have passed comprehensive written and oral examinations and have maintained the highest ethical standards of practice. It’s also important to make sure they have years of training and experience performing the type of procedure you are looking for. Cosmetic surgery consists of a broad range of procedures, and not all providers have the same level of training or experience. Usually this information can be found in the biography section of their website. Lastly, it’s so important to choose a surgeon that you feel truly understands your needs and concerns, listens to you, and clearly communicates with you. 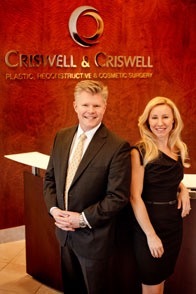 Both Dr. Bryan Criswell and Dr. Kara Criswell have obtained almost every plastic surgery certification available and have dedicated their careers to ensuring their patients’ complete comfort during all procedures. They believe that creating a strong patient-doctor relationship based on mutual trust creates the most conducive environment for healing and personal growth. Schedule your consultation in Charlotte today by calling 704.424.5050 and discover what Criswell & Criswell Plastic Surgery can do for you!